Everything that the saddler sold came back eventually, after hard wear, so that he could attempt to breathe new life into it. Often what came in had been old before he began to train to the trade, but he was still expected to revive it at the least possible cost. Country saddlers went bankrupt with some regularity, because farmers (and other customers) wanted a job done quickly but they usually suffered from "short arms and long pockets" when it came to paying the bill. The Penrith saddler until the late 1980s was Mr Gordon Lancaster. 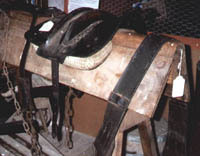 and a sturdy leather headcollar which, again, has had new parts applied by the saddler. This harness is designed for a cobby pony to pull a working cart or a coal tub. The heavy saddle carries the ridge chain that holds up the shafts. Hold your mouse over the saddle to find the ridge bar (also known as a redger bar) which keeps the chain in place. This is only a part set of harness. 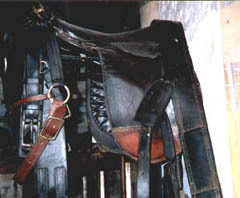 The breeching (shown at the right hand end of the saddle-horse) would go round the horse's quarters to hold back the cart. It was fixed to the shafts of the cart close to the ridge chain. The harness would be completed with a collar and, probably, short chain traces which again were fixed to the shafts in the same area as the ridge chain.